Buy this book at Amazon, Barnes and Noble, IndieBound, iBooks, Kobo, Powell's or BAM. From the best-selling author of Subliminal and The Drunkard’s Walk comes a groundbreaking look at the psychology and neuroscience of change, and at how tapping into elastic thinking will help us thrive in the modern world. Drawing on cutting-edge research, Leonard Mlodinow takes us on an illuminating journey through the mechanics of our minds as we navigate the rapidly changing landscapes around us. Out of the exploratory instincts that allowed our ancestors to prosper hundreds of thousands of years ago, humans developed a cognitive style that Mlodinow terms elastic thinking, a unique set of talents that include neophilia (an affinity for novelty), schizotypy (a tendency toward unusual perception), imagination and idea generation, and divergent and integrative thinking. These are the qualities that enabled innovators from Mary Shelley to Miles Davis, from the inventor of jumbo-sized popcorn to the creators of Pokémon Go, to effect paradigm shifts in our culture and society. In our age of unprecedented technological innovation and social change, it is more important than ever to encourage these abilities and traits. How can we train our brains to be more comfortable when confronting change and more adept at innovation? How do our brains generate new ideas, and how can we nurture that process? Why can diversity and even discord be beneficial to our thought process? 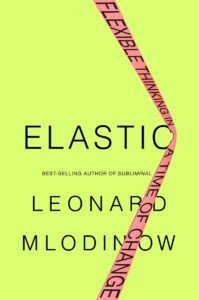 With his keen acumen and quick wit, Leonard Mlodinow gives us the essential tools to harness the power of elastic thinking in an endlessly dynamic world.